Poor Selina. She may be a terrible person and an even worse mother, but when Selina spends “Chicklet” lovingly reminiscing about her father, only to discover lies and betrayal hiding behind each memory, it’s hard not to feel for her. It’s impressive that six seasons in, Veep can still prompt such sympathy for its narcissistic, oblivious, and frequently cruel protagonist. The series has never shied away from Selina’s hypocrisy and egotism, traits fully on display in this episode, but it hasn’t always found space to show vulnerability or pathos. This approach could make Selina’s intermittent humanity feel forced when it pops up, a pandering attempt to soften an unlikable character. However instead of treating her unguarded moments as a balm for her usual harsh persona, explaining away and excusing her choices, the Veep writers (Gabrielle Allen and Jennifer Crittenden are credited this episode) and Julia Louis-Dreyfus make these moments part of a larger, cohesive whole, giving the audience a sense of where Selina’s ego-centrism came from without ever apologizing for it. Episodes like “Chicklet” underscore, rather than negate, her anti-heroic tendencies, making the comedy land harder and casting Selina in a darker light than if the series never explored her potential for kindness and understanding. Louis-Dreyfus is fantastic here, as she always is. Six seasons in, it’s easy to take her consistent, committed performance for granted, so it’s worth mentioning again how comfortable Louis-Dreyfus is in the role and how seamlessly she flows through Selina’s changing moods this episode. There’s a terrific self-awareness to Selina that Louis-Dreyfus nails when Selina reflects on her happy memories of her father, as she did in season five’s “Kissing Your Sister.” Selina’s excited to share a particularly meaningful quote from her father or the circumstances of a particular exchange, but she can hear how desperate and sad her childhood sounds the moment she’s said the words, and Louis-Dreyfus brings out every nuance of this. Season six has also seen an uptick in physical comedy, particularly from Louis-Dreyfus and Tony Hale, and this episode continues that trend, with Selina and Mike drunkenly destroying her family’s former stables. It’s been great to see the series return to this well. 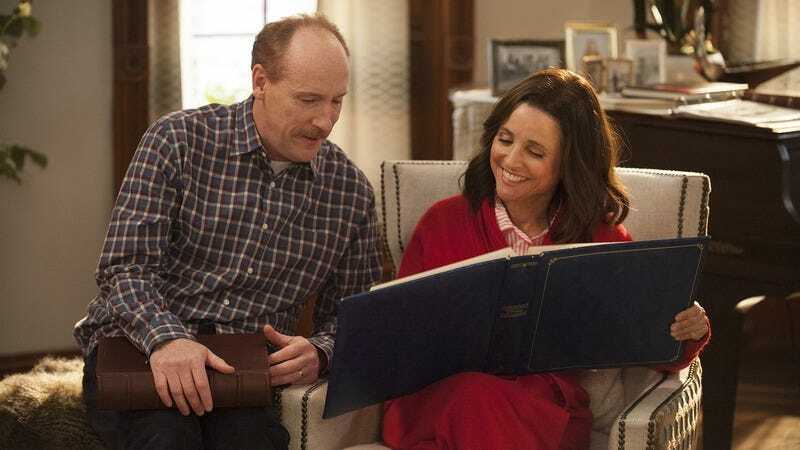 Louis-Dreyfus is a gifted and very game physical comedian, and while Veep is best known for its smart and savage dialogue, it’s at its best when taking advantage of its cast’s full range of talents. The focus in “Chicklet” on Selina’s childhood and her slow disillusionment with her father makes for a compelling and very entertaining center of the episode, but almost more welcome is the decision to pair Selina with Mike. Matt Walsh has been underserved all season and without press briefings to give, Mike hasn’t fully clicked, left to fret in the background as Selina refuses to work on her book. This is the most prominent Mike’s been in a long time and the writers make the most of Selina and Mike’s short-lived friendly dynamic, and the jealousy this spurs in Gary. His success in getting Selina to open up lets him have a (temporary) win and it lets Walsh play something other than Mike’s typical woebegone self. Particularly nice is Walsh’s channeling of Mike’s rage at Selina and life in general when smashing up the former stable. Yes, it’s fun to hear him shout out his frustrations with Selina, but that generalized fury turning inward, prompting Mike to yell, “I’m a grown man. I shouldn’t eat when I’m full” is something special. Given the end of the episode, Mike’s time in the sun is likely over, but now that he has plenty of material to at least start Selina’s book, hopefully Mike will now be able to do more than hover and wait to pepper Selina with questions. Elsewhere this episode, the season arcs of Catherine and Marjorie’s attempts to conceive, Jonah’s love life, and Dan’s struggles at work progress nicely. There was some speculation last week that Catherine and Marjorie might turn to Gary to be their sperm donor, but Richard is a better choice. While he may have signed away his paternal rights, it’s hard to imagine Richard fully understanding this and not chiming in here and there with Splett family wisdom and advice, and based on Grandma Splett’s thoughts on microwaves and laughter, it’s bound to be entertaining. The revelation that Richard has never masturbated (and has many questions and misconceptions) is downright hilarious. His exchange as he goes in and out of the sample room while talking with Catherine and Marjorie is played and timed incredibly well by Sam Richardson and the director, Beth McCarthy-Miller, and editors. As for Jonah, who adorably puts his beef with Richard on pause so they can gossip, his connection to Sherman Tanz is already proving valuable, with Jonah meeting his match in Sherman’s equally calculating and evil daughter. It’s a promising setup for the second half of the season, and watching Ben and Kent contend with her should be a blast. Then there’s Dan, who finally realizes where the rumors about him and Jane have been coming from. It’s interesting to think back and speculate about which of their interactions have been genuine and which have been for the benefit of the crew. Watching Dan, the ultimate player, get so completely outclassed and maneuvered by Jane is great, and immediately makes her a more intriguing character. Season six started with Veep seemingly putting its political commentary on hold and focusing in on character, while simultaneously ratcheting up the least compelling personality traits of Selina and her team. Now, half-way through the season, the political satire is back as strong as ever and several of the characters—most notably Selina, Gary, Mike, and Dan—have been given a chance to stretch their legs and show different sides of their personalities. “Chicklet” may not match the audacity and sheer comedic power of season five’s best episodes, but it’s a dramatic improvement on where the season started and another strong addition to Veep’s canon. Gary and Amy’s subplot about the challenges of placing Selina’s Madame Tussaud’s replica somewhere meaningful, but in Gary’s words, “safe,” is delightful. Tony Hale’s reactions to the various images of patrons mistreating the replica are pitch perfect, as is Selina’s unsurprised reaction to what’s been happening to her replica. Another great Gary moment: His impressed, “Respect” to Dan at hearing the rumor that he’s sleeping with Jane McCabe. Jonah somehow keeps failing upwards, politically and now romantically, and in today’s political climate, that feels particularly appropriate. Having Andrew drop by to remind everyone just how gross and horrible he is works very well, and underlines Selina’s realizations about her father. I like to think that Catherine understands exactly what he is but indulges him anyway. It’s not great, but it’s better than her being duped by his ridiculously thin explanations. It’s not the funniest line of the episode, but Louis-Dreyfus’ delivery of, “Squirrel, you’re an intense little girl, and now you finally have a friend,” and her expression afterwards, makes it my favorite.